The best way to enjoy Folly Gras is by staying on the island. 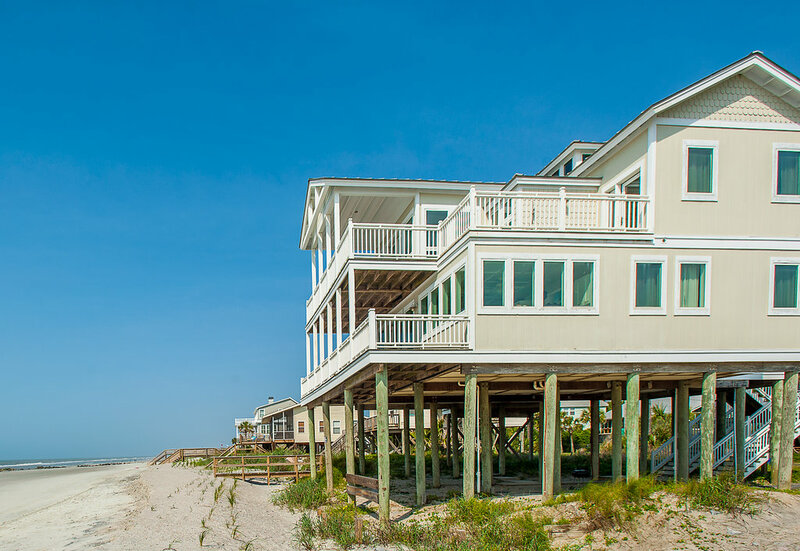 Whether you are a local in need of a staycation, or visiting us from out of town, we have the perfect vacation homes and villas for a fun Folly Gras weekend. 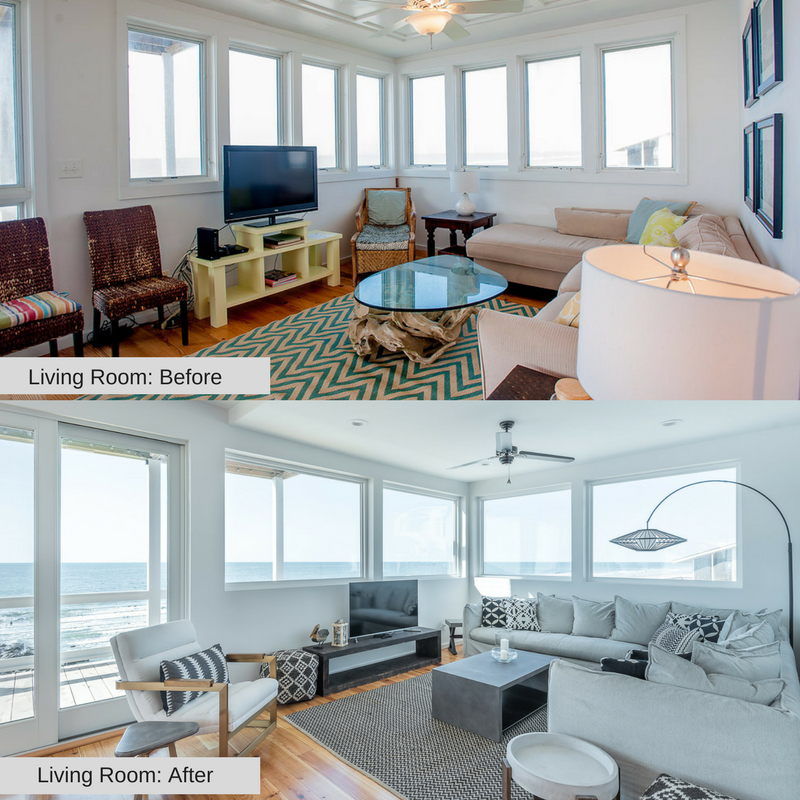 Check out our Folly Vacation Rentals to be in the middle of the action or far enough away to peacefully unplug when you’re ready for some relaxation. 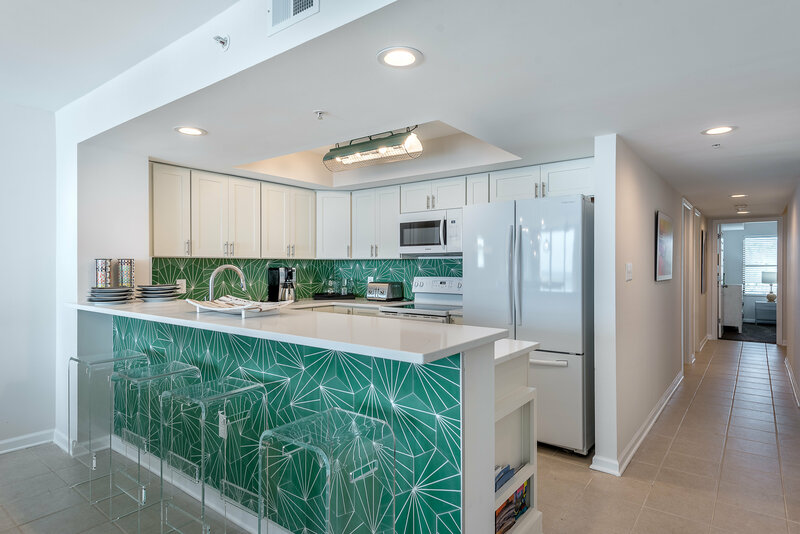 We’ve got vacation rentals spanning all of Folly Beach to offer a variety of experiences, and we’ve got a front row seat for the Folly Gras festivities from the dunes properties Folly Beach office, which is located at 31 Center Street. For tickets and more info about the vendors, music, and more, check out VisitFolly.com and Let the Good Times Roll, Lowcountry Style! 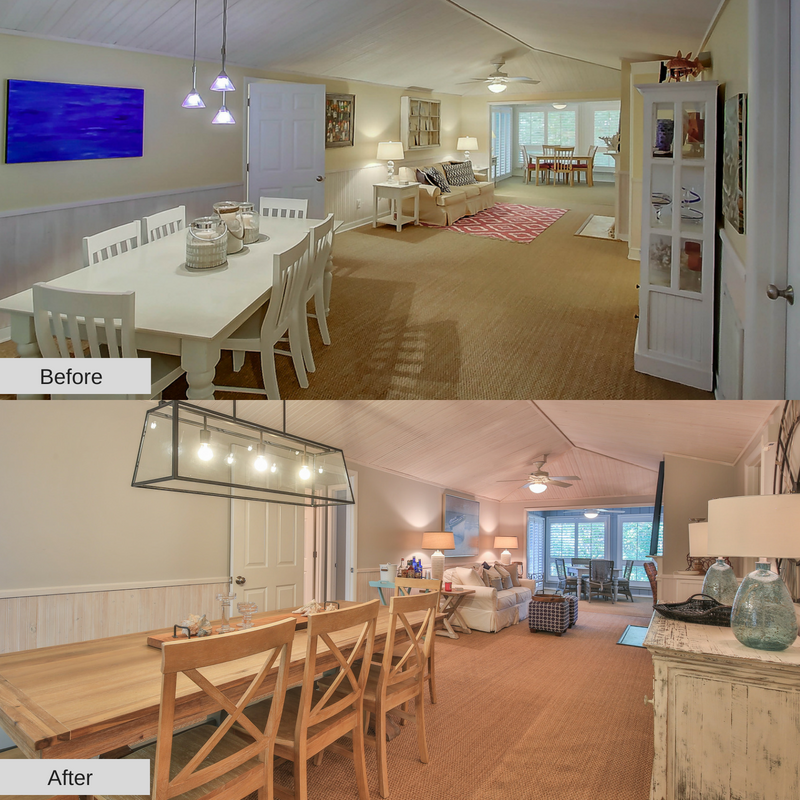 We love a good before & after and 36 Twin Oaks in Wild Dunes is no exception! 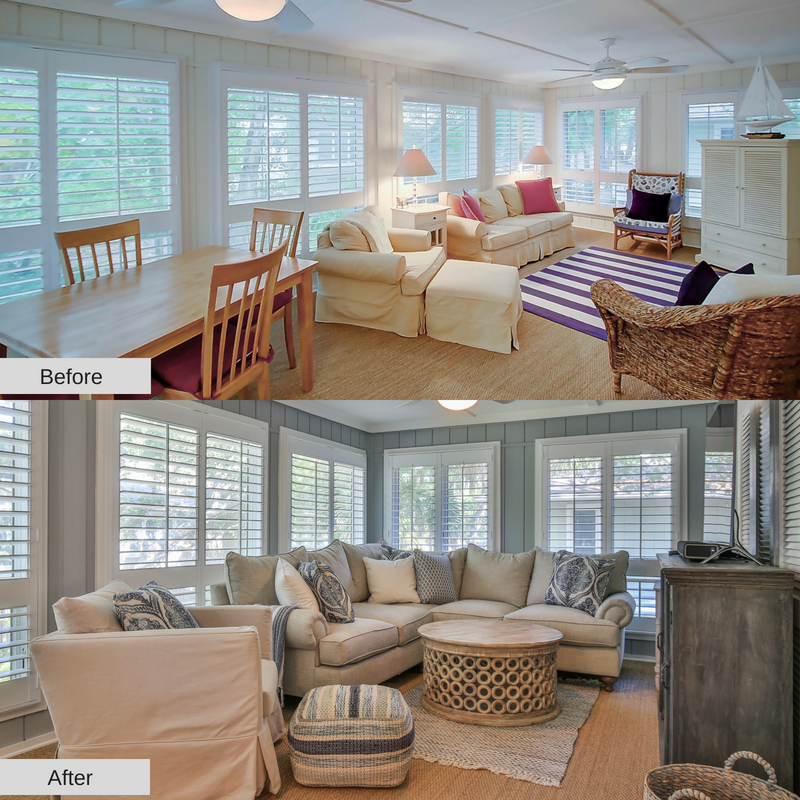 This quaint resort cottage underwent a furniture and decor update that captures the upscale, beach vibe of the resort. The original dining table was small and didn’t offer much space for families during a big beach breakfast or dinner. The new dining table, chairs, and bench are a welcoming site when walking through the front door. This table provides plenty of seating for the number of people the house sleeps (6) plus all the dishes that will be on the table! 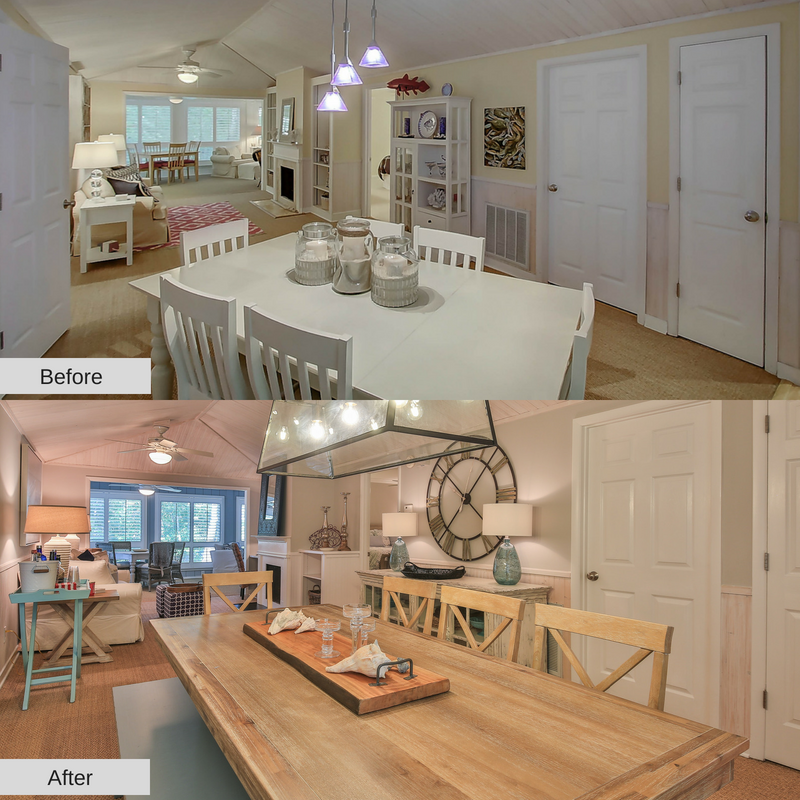 The new light fixture adds a modern vibe to the beach cottage. The original living room set up was comfortable and well appointed. 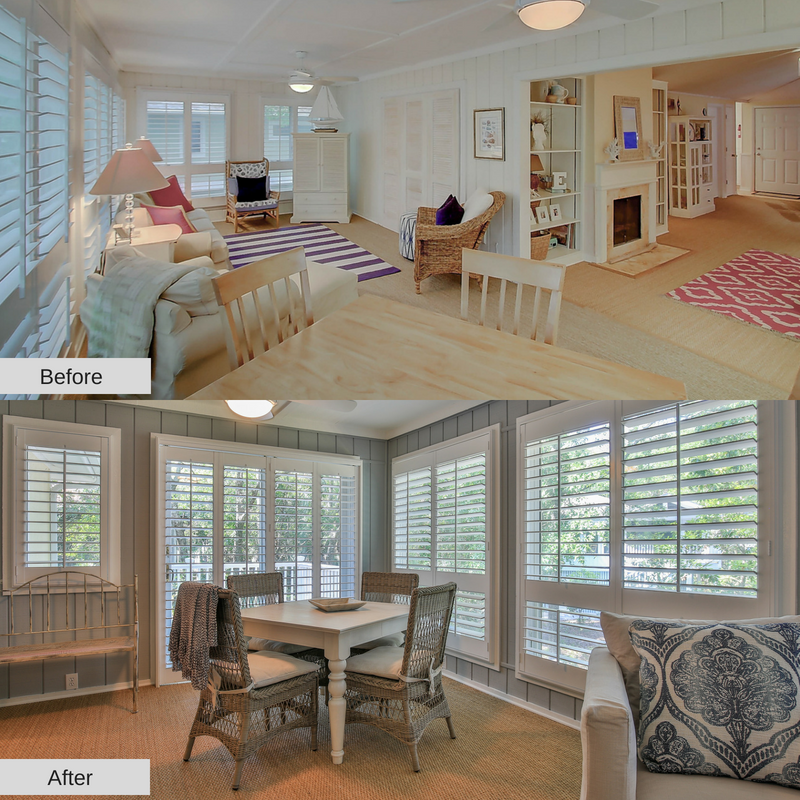 But, lowering the built-ins makes the space feel larger and more open. The cozy couch and accent ottomans add character to the space. Plus, turning one built-in into a desk provides an area for those on a working vacation or a great space for kids to write, read, and do homework. 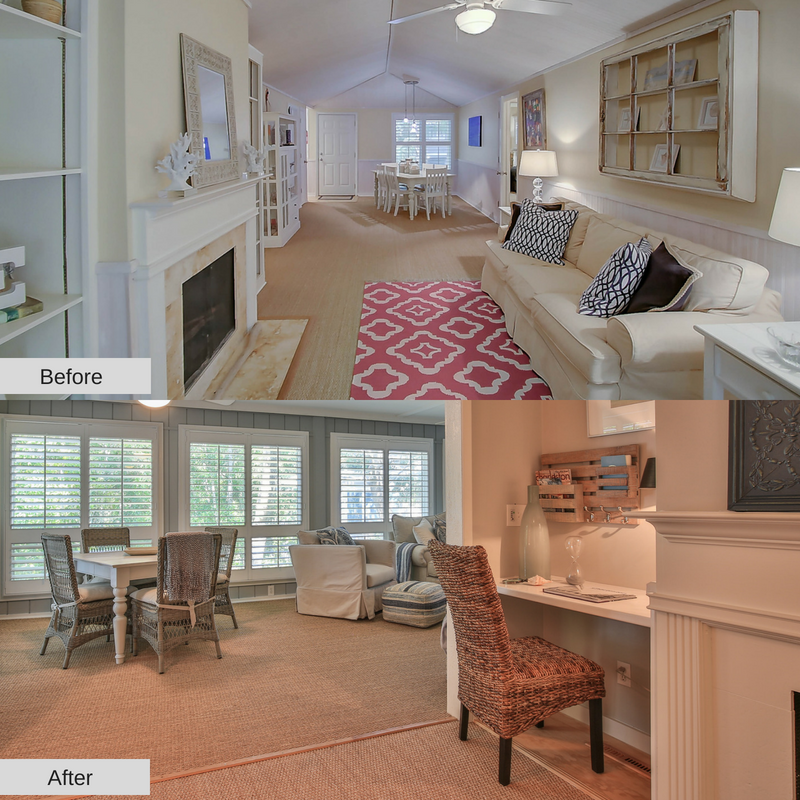 The sunroom transformed from a comfortable sitting room with extra dining space to a chic, cozy room with space for the entire family. The large, deep sectional is perfect to lounge on during rainy days or a family movie night. While the card table provides space for puzzles, canasta, or board games. The sunroom is now a room the entire family can enjoy at the same time! 36 Twin Oaks boasts three bedrooms and two renovated bathrooms. Each bedroom has a flat screen tv with cable. 36 Twin Oaks offers a backyard porch with a bar height table and chairs with a grill for outdoor dining. The home is located within walking distance to everything the resort has to offer. 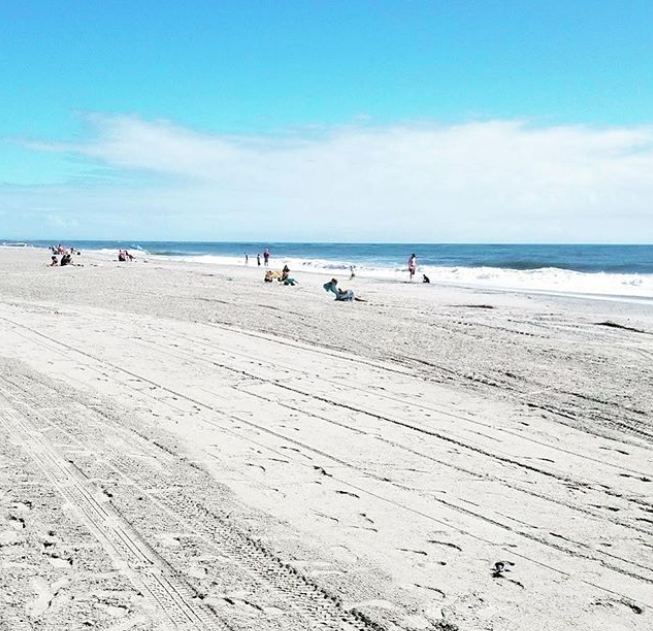 The beach is a short 15-minute walk while the Village at Wild Dunes, home to restaurants and shops, is only a 10-minute walk from the front door. While vacationing within the resort, enjoy the miles of biking and walking trails, the playground, and golf. Book your stay at 36 Twin Oaks today! 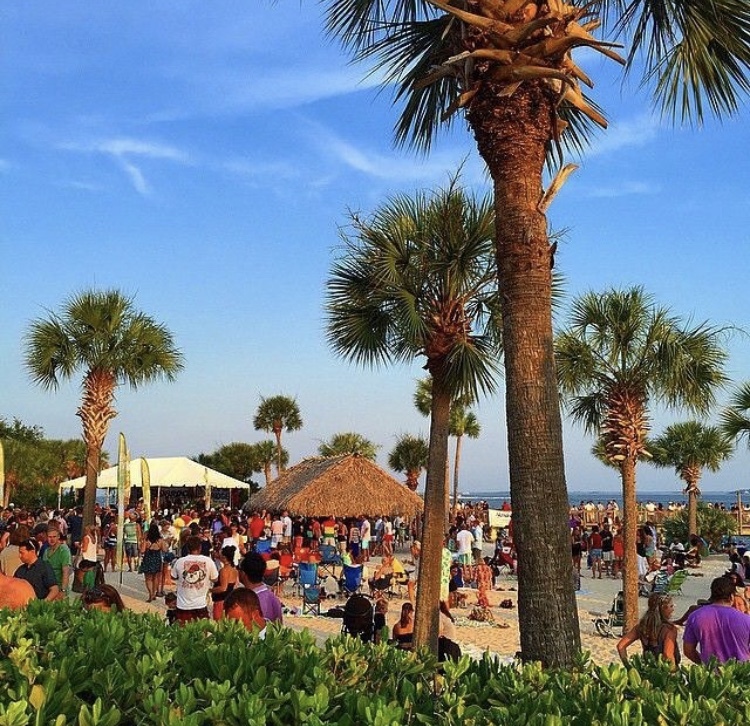 There are a plethora of summer events and activities on the Charleston Coast. To help you narrow down which activities fit your vacation the best, we have created a list of summer events in late June and July. Head to The Joe for a night of baseball, hot dogs, and gorgeous sunsets! The Joe, the nickname for Joseph P. Riley Stadium and home of the Riverdogs, sits on the Ashley River. This location provides views and sunsets that rival any in Charleston. The Charleston Riverdogs are a minor league baseball team known for fun promotions and giveaways. The Riverdogs provide an afternoon or evening of fun and games for the whole family. Be sure to check out the bouncy castle and don’t forget to get your face painted! Like many ballparks these days, The Joe offers a wide selection of hot dogs that vary each season. This year’s hot dog options include an all wagyu beef hot dog wrapped in edible silver leaf topped with pork belly, lobster, and champagne garlic aioli in honor of the ‘Dogs 25th anniversary – which is this year! 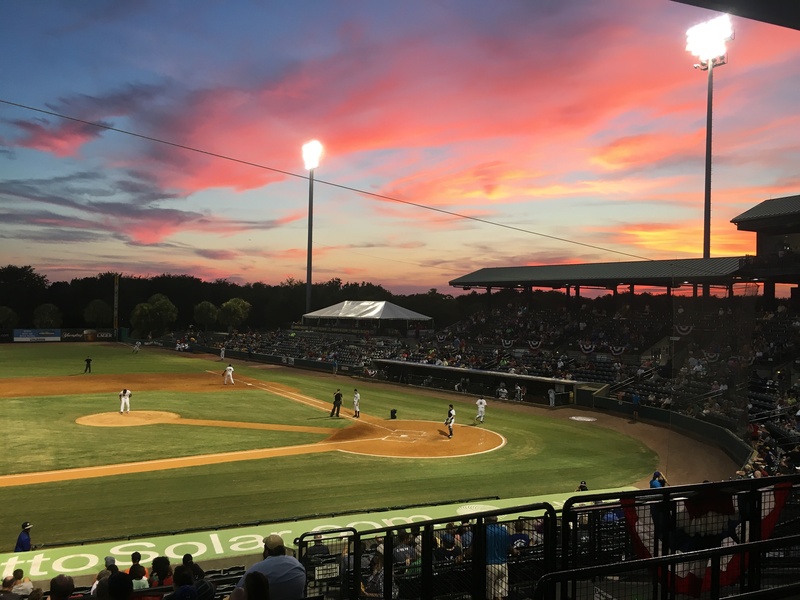 The Riverdogs regular season goes through August. Be sure to make a visit to The Joe a can’t miss on your Charleston to do list! July 4th will be here before we know it. 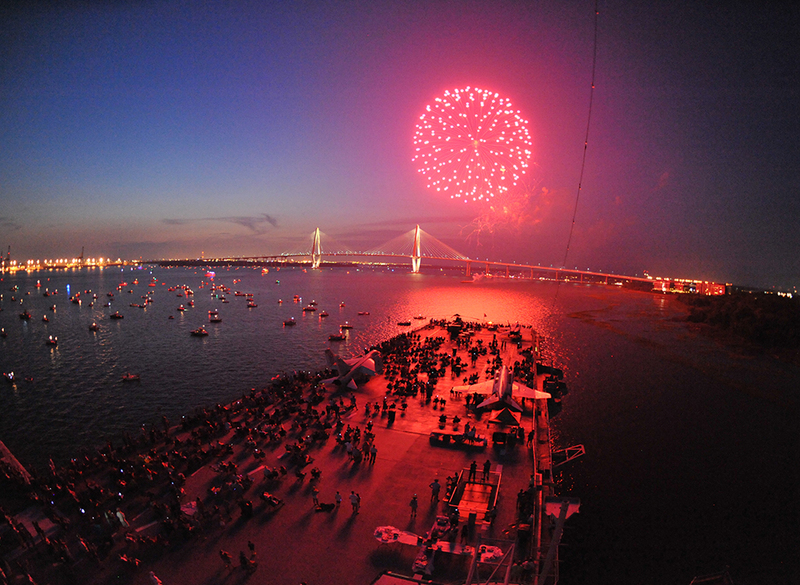 The Charleston Coast is home to numerous Fourth of July celebrations. Each beach town usually has their own fireworks celebration. Here are a few additional events around town for fireworks watching! Charlestonians all have their own reasons for loving the Holy City and one reason everyone can agree on is the love of food & cocktails. The Charleston Margarita Festival brings together some of the most popular restaurants for a day of friendly competition. This year the festival is at Brittlebank Park (right next to The Joe!). Spend the evening sampling 20+ margaritas, enjoying delicious food and good music, and you will likely have a front row seat to a breathtaking sunset. The Charleston Margarita Festival is a 21+ event – so hire a babysitter and get ready for a night out! This family-friendly concert series happens every Friday from April to June. The waterfront location provides the perfect setting for a laid-back, Lowcountry Happy Hour. Live music along with good food & drinks make this a fun event for the entire family. 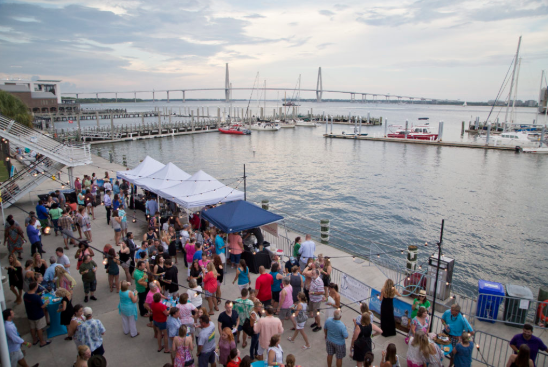 Party at the Point is hosted at the beach at Charleston Harbor Resort & Marina. Kids love playing in the sand and dancing along to the bands! You are welcome to bring in beach chairs, towels, and blankets to set up the perfect spot to enjoy the festivities. There are only a few Fridays left in June – don’t miss your chance to enjoy this fun summer event! Heading to one of these summer events? Let us know what you think! We love spring on the Charleston Coast! 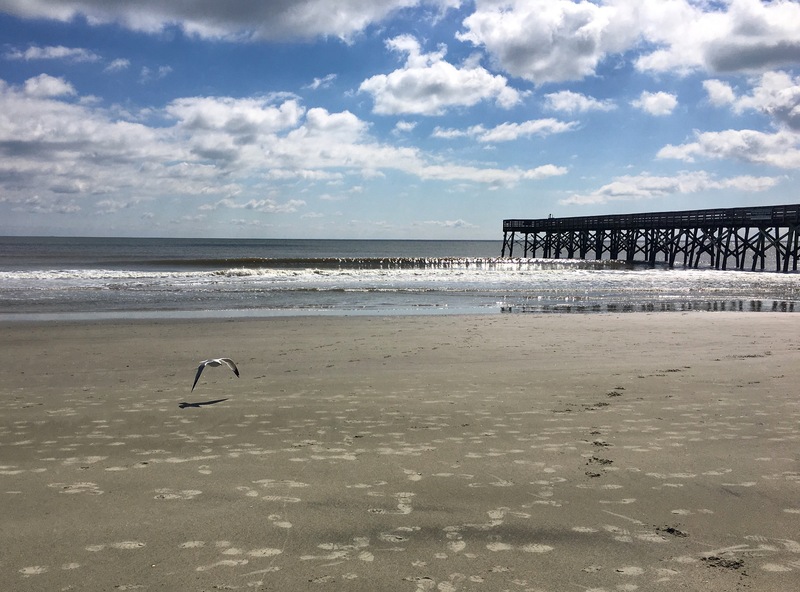 The weather is perfect for spending a day at the beach or exploring all the Charleston Coast has to offer. 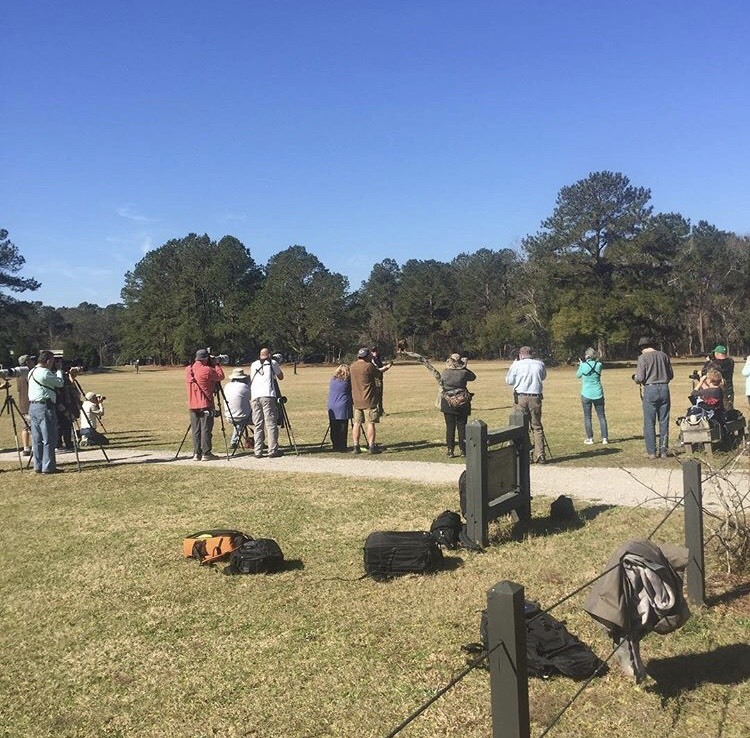 We have compiled a list of outdoor activities on the Charleston Coast so you can take full advantage of the beautiful weather! The gorgeous Ravenel Bridge, as it is locally known, has quickly become a Charleston Icon. The Ravenel Bridge opened in July 2015 and connects Peninsular Charleston with Mt. Pleasant. The bridge has a pedestrian and bike path that provide outstanding views of the Charleston Harbor, Peninsular Charleston, and Mt. Pleasant. 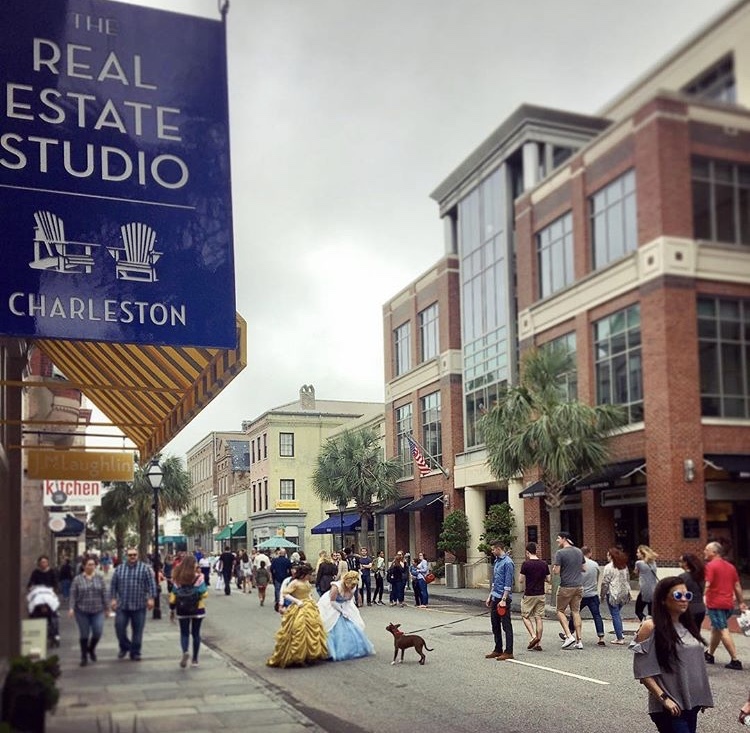 Walk, run, or bike your way across this Charleston Icon! 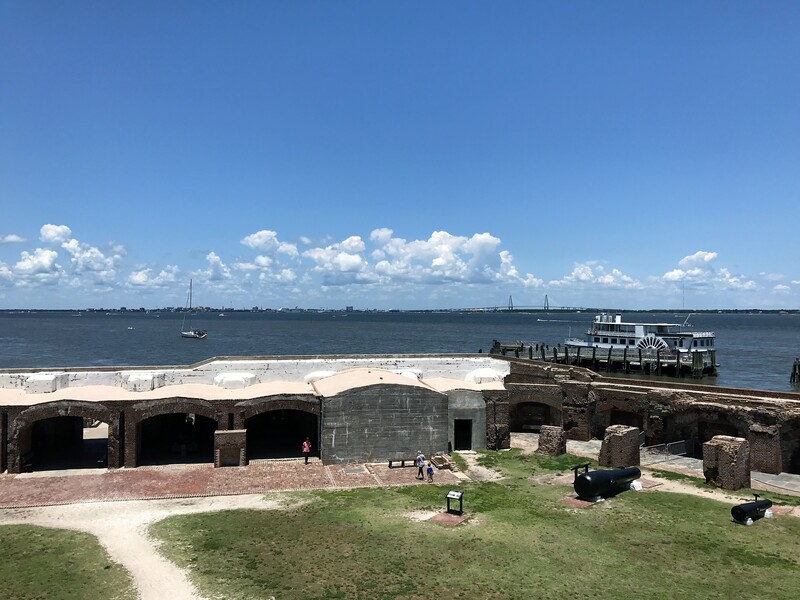 While we’re talking about the Charleston Harbor, why not take a tour of Fort Sumter? The tour includes a ferry ride of the Charleston Harbor filled with Charleston History and beautiful views. If you keep your eyes peeled, you will likely see a dolphin or two (or three!). Fort Sumter is where the Civil War began and holds an important place in American History. See where the first shots were fired and learn about Charleston’s important, and lengthy, place in American History. The Charleston City Market is a mix of open air and enclosed stalls. Vendors sell everything from sweetgrass baskets and handmade jewelry to homemade sweets and local art. If you’re looking for a gift for your family or friends (or yourself!) be sure to stop by. 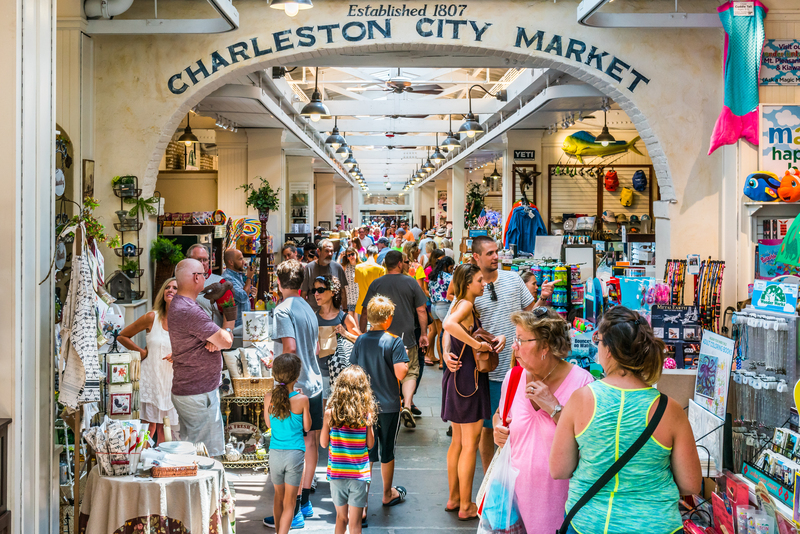 The Charleston City Market is open daily year round and opens for a night market on Fridays & Saturdays. While in Charleston, visit the only tea plantation in North America. A visit to the Tea Plantation is free! Tour the tea production building, visit the gift shop, and marvel at the acres upon acres of tea plants. The only charge (besides a souvenir from the gift shop!) is for the trolley tour. The trolley tour takes you through the tea fields and stops by the greenhouse. The closest tea plantations are in Asia, Africa, and South America making this a once in a lifetime visit! King Street is a wonderous street that can be considered the Main St of Historic Charleston. The lower end of King Street is known for its outstanding shopping. You can spend the entire day just on this half of the street! Upper King Street (north of Calhoun Street) is home to numerous galleries, delicious restaurants, and fun bars. If you’re in town for it, we highly recommend Second Sunday on King. Taking place every second Sunday of the month throughout the year, Second Sunday on King shuts down the lower half of King Street to vehicle traffic. Pedestrians, dogs, vendors, and restaurant tables line the street for the day. Enjoy open-air dining, shopping specials, and more dog sightings than you can imagine! What are your favorite outdoor activities on the Charleston Coast? Let us know! We are always looking for fun outdoor activities for ourselves, our families, and our guests! Last week, we discussed when and how to renovate your vacation property. This week, we are featuring the most amazing Transformation Tuesday we have ever seen! 1215 E Arctic Ave on Folly Beach, formerly known as “The Blue Lagoon”, underwent a total renovation between September 2017-March 2018. 1215 E Arctic Ave Before! 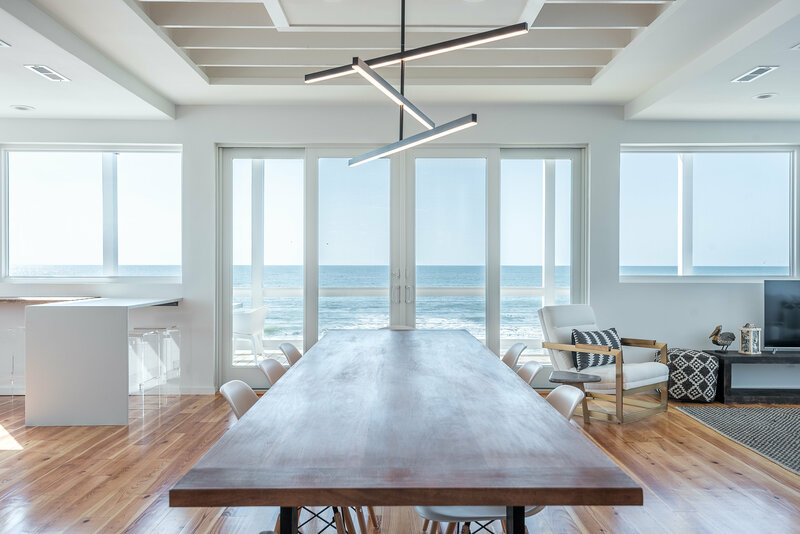 Now know as “Saylors’ Malibu”, 1215 E Arctic is a stunning oceanfront home which provides not just oceanfront views, but on the beach feels. 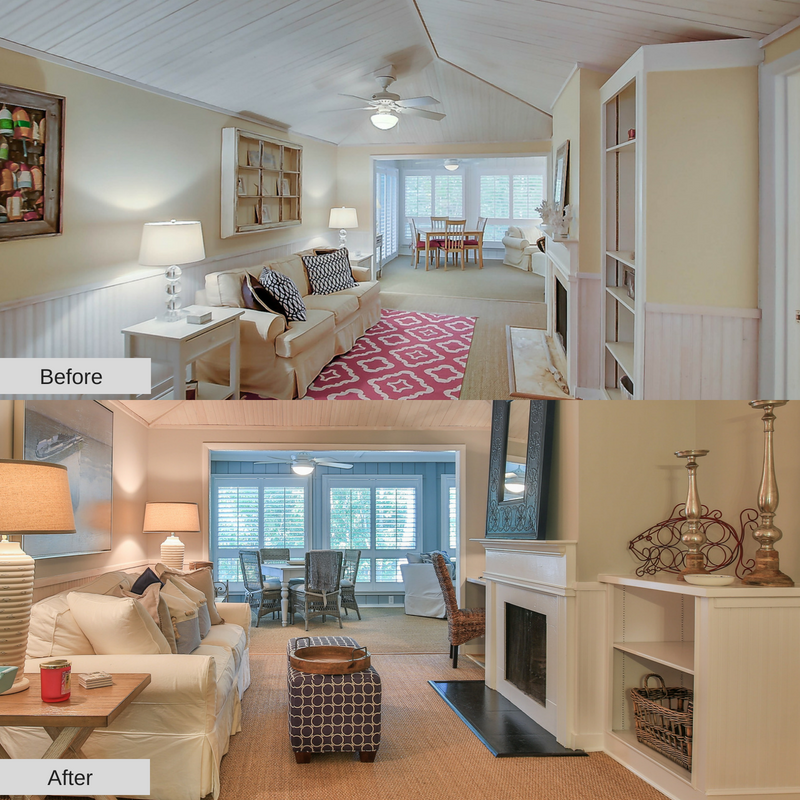 The renovation was completed by one of the Lowcountry’s best teams and boy can you tell! After! Check out the gorgeous new windows! Custom pieces are plentiful in the home. From the custom 10-seat dining table to the live-edge hardwood custom bar in the kitchen, no piece of the home was left untouched. In the bathrooms, unique tiles on the floors and in the showers help make each room a little different from the next. Custom Dining Table with breathtaking views of the Atlantic Ocean. “Saylors’ Malibu” is a home you will want to vacation in year after year. Secure your 2018 and 2019 vacation today! The cozy living room lacked cohesion before the renovation. Now, the living room radiates perfection. The sectional sofa ensures seating for the whole family while you watch tv, read your favorite book, or just stare out the gorgeous new windows! The designers kept a similar, mostly white, open and airy feel in the kitchen. But, the custom cabinets and custom live-edge hardwood bar top enhance the natural beauty of the space. The new windows leave you feeling like you’re on the beach from the comfort of the kitchen. New furniture and simple, understated accent pieces tie together one of the guest bedrooms. The master bedroom feels more sophisticated now. The new floor to ceiling windows provide natural light that balances the dark wood of the furniture. In the master bathroom, a change in paint color and opening the walk-in shower changes the entire feel of the room. The textured tile in the shower provides depth to the space. 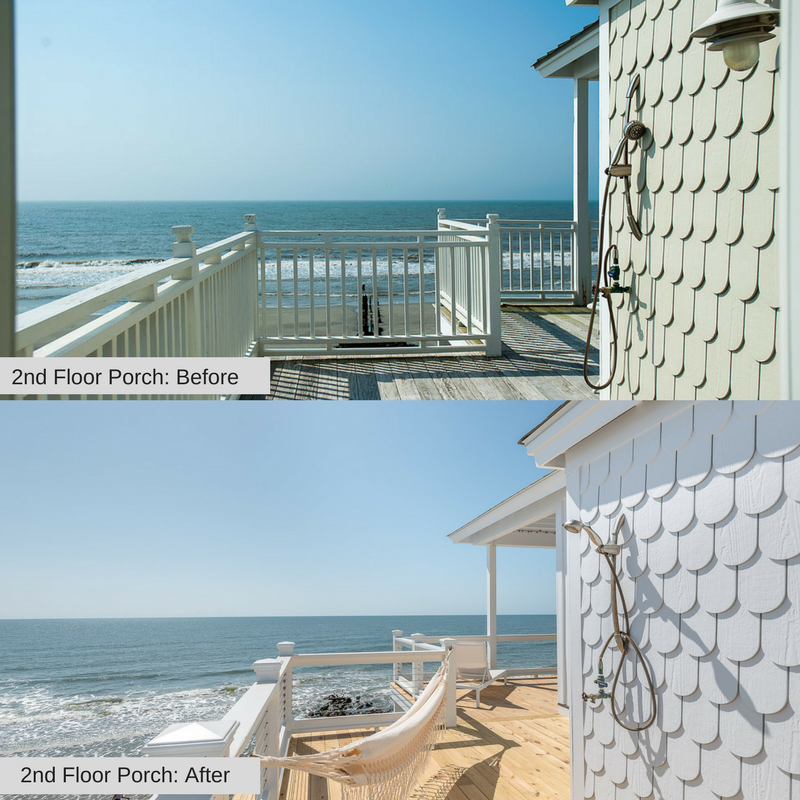 Updating the railings and porches, along with painting the exterior, makes the outside living spaces more desirable. Take an afternoon nap in the hammock “on the beach” without getting sandy! Renovations are all the rage these days. 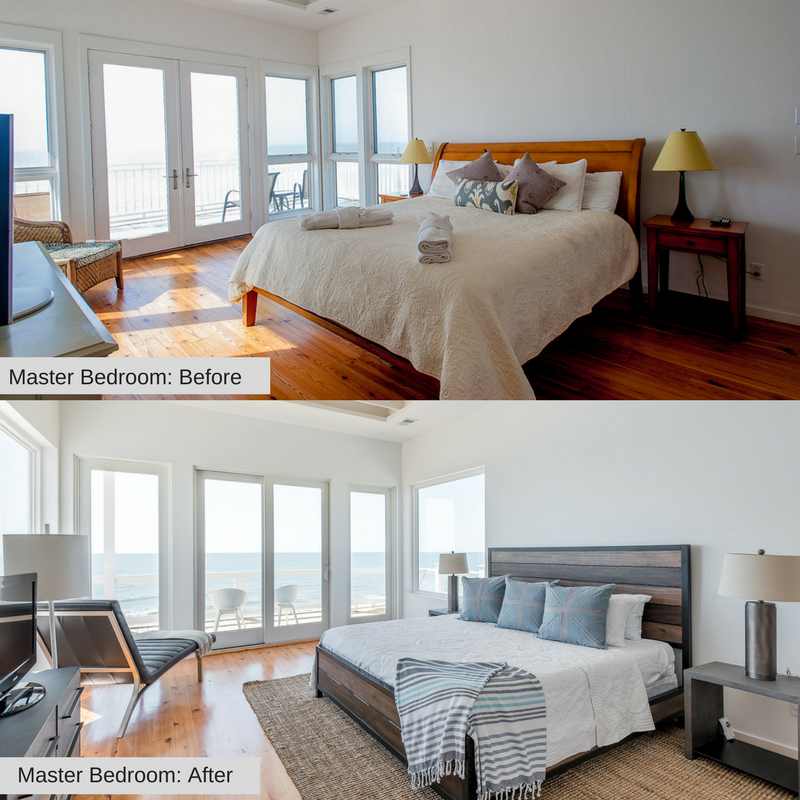 From the endless number of tv shows highlighting home renovations to the posts on social media by interior designers and bloggers, the renovation ideas are endless! So, that begs the question, when should you renovate your vacation home? The simple answer to the question is: as soon as you can! Renovations are best done during the offseason when guests are not disturbed. This way, your vacation home is in pristine condition for peak season. 1695 E Ashley Ave “The Scandinavian” underwent a total renovation! We have found the days of kitschy beach decor and wicker second-hand furniture are behind us. Guests are looking for modern, updated and top of the line for their vacations. 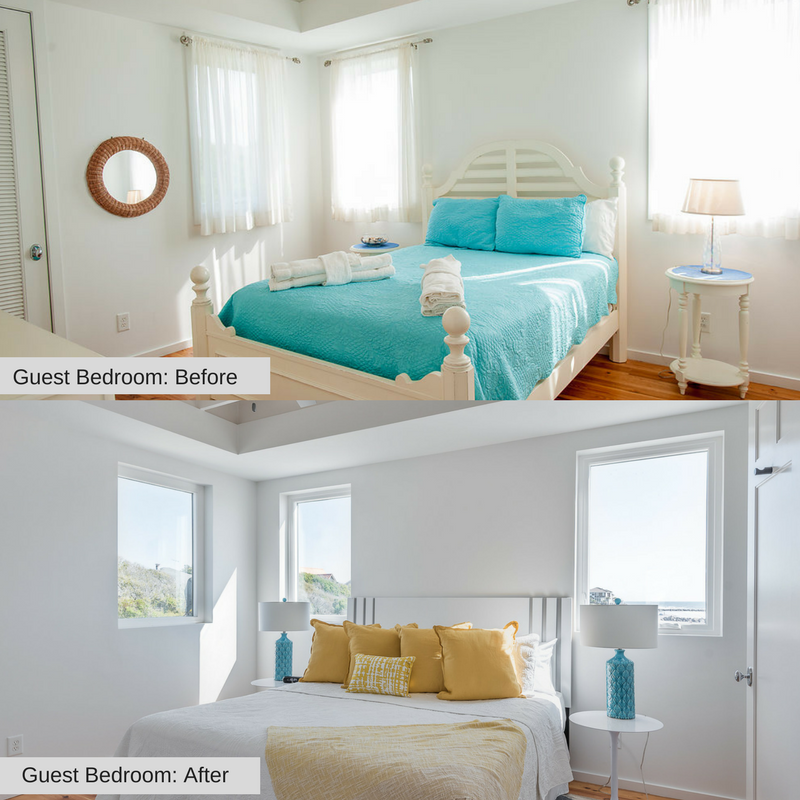 The two areas that really show a guest the vacation home is renovated are the kitchen and bathrooms. 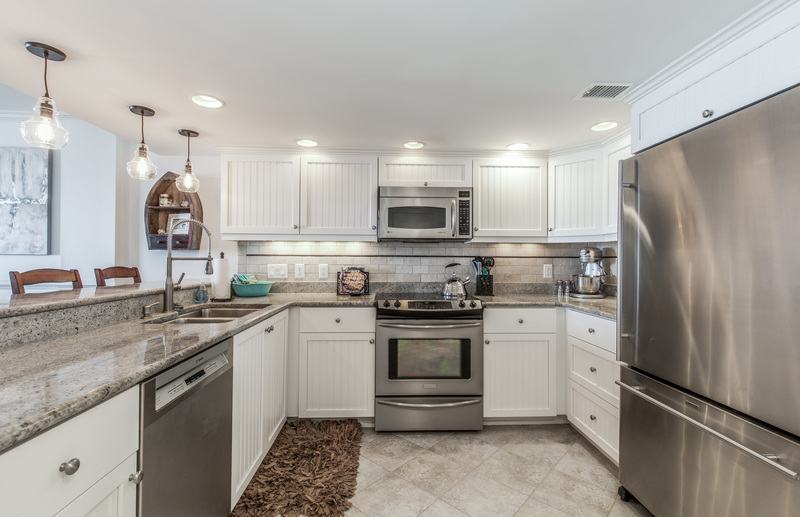 3502 Palm Blvd “Sea Star” has a brand new kitchen! 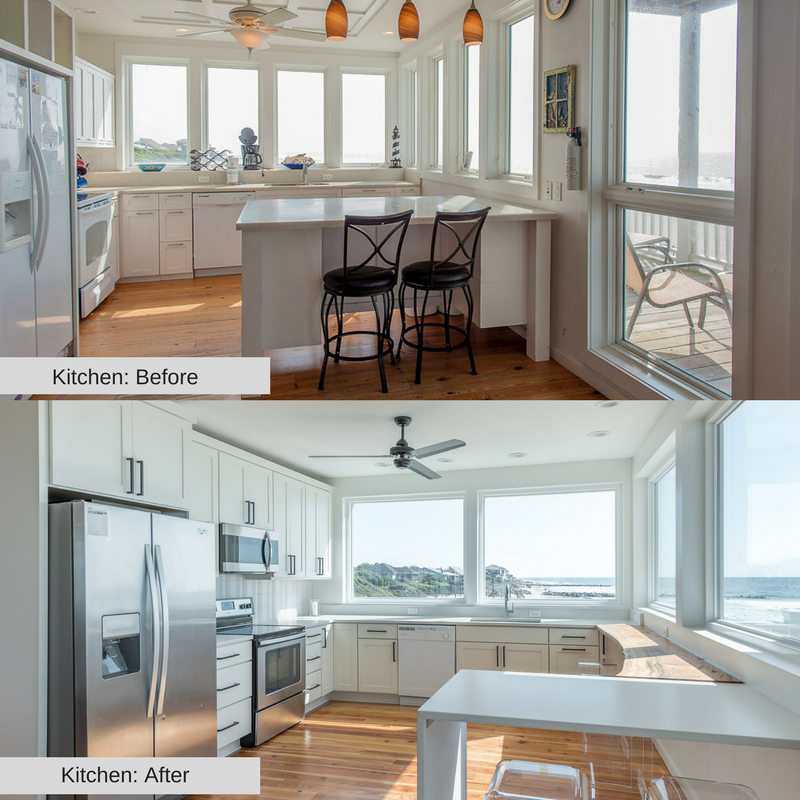 Renovated kitchens are so important for guests when booking their vacation. 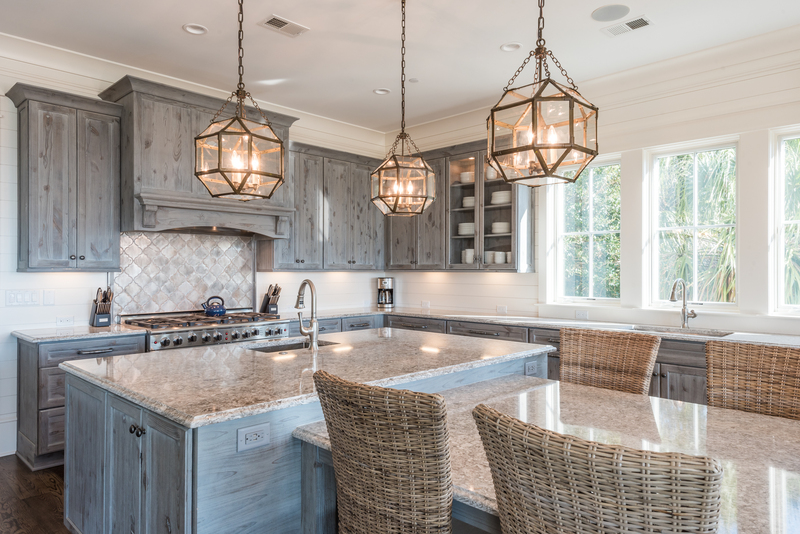 Guests opt for a vacation rental so the family has the option to cook meals in the house and not eat every meal out. So, kitchens with sleek, modern appliances stand out. Especially if these kitchens have beautiful custom cabinets and countertops. Little touches like a chalkboard wall or a built-in drink fridge can make or break a guests decision to rent the property. 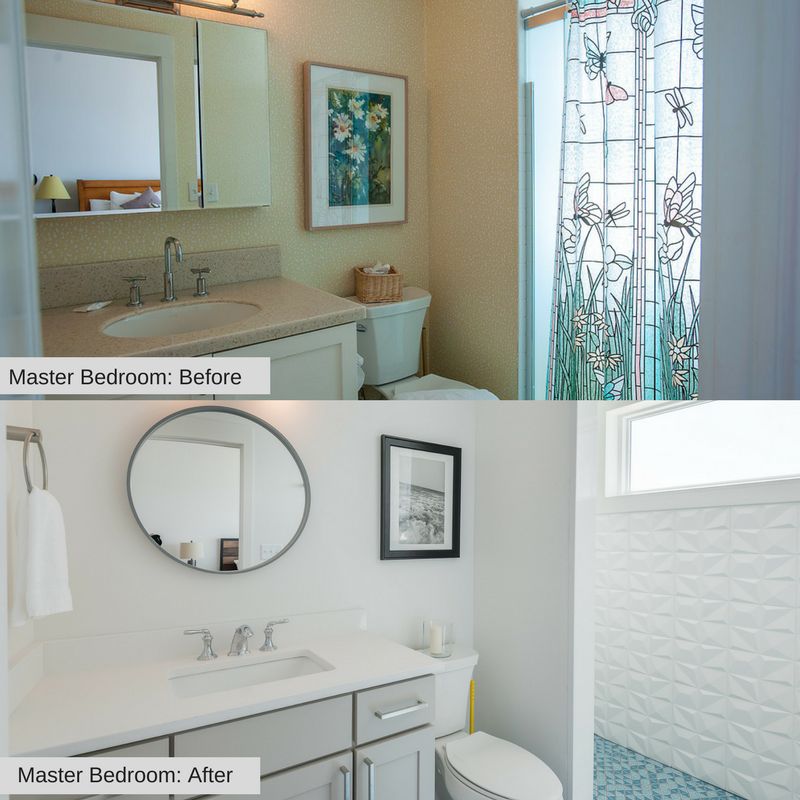 A renovated bathroom shows the guests that the homeowner cares about the property. Clean lines, tiled showers and tub surrounds, and walk-in showers really grab the guests attention. 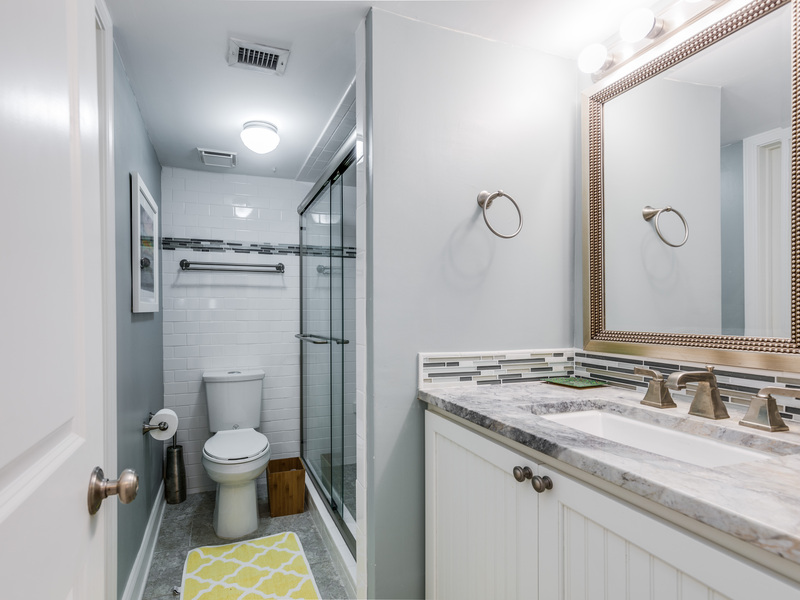 For properties with more than one bathroom, it is important to remember that families, possibly with young children, will be vacationing at the home. Families with young children often look for a vacation rental that has at least one tub in the property. This way, the kids can still take their evening bath. 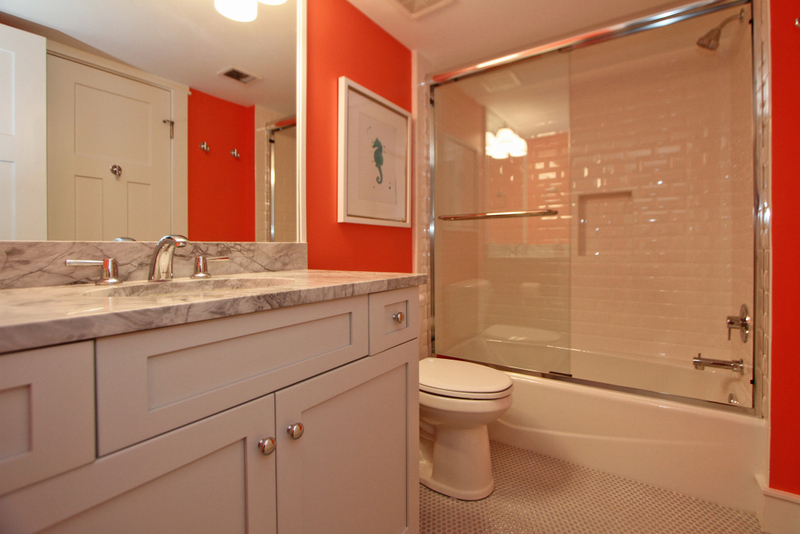 The pop of color in the guest bath at C419 Shipwatch Villas is perfection! Check out the photos below for some design inspiration! 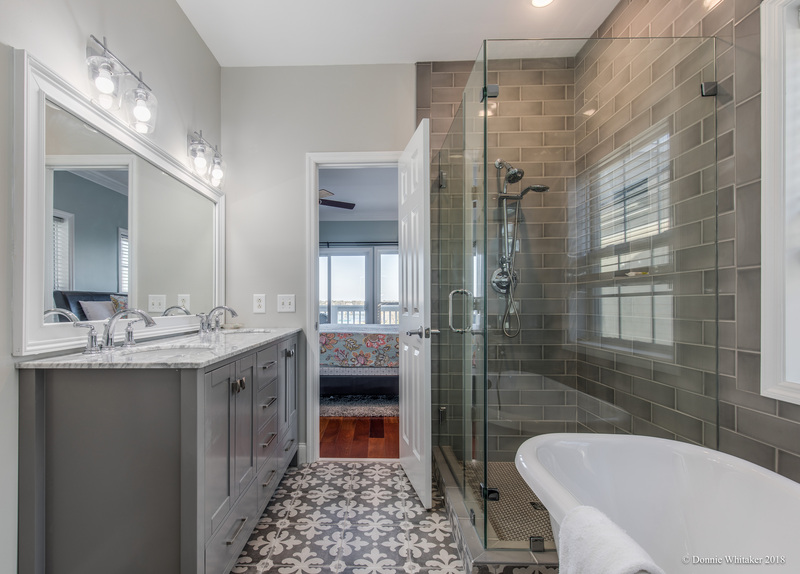 212 Charleston Oceanfront Villas “Sea Folly” has a gorgeous master bathroom! The glassed-in, walk-in shower perfectly balances the room. The guest bathroom at C420 Shipwatch Villas “Royal Dune” is perfection! The neutral colors allow the homeowner to add a pop of color with a bath mat or artwork. 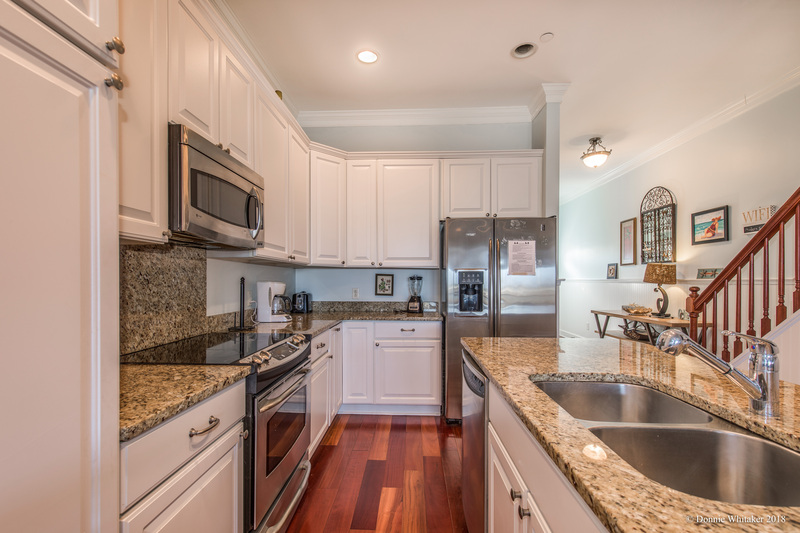 What isn’t gorgeous about the kitchen at 1408 E Ashley Ave “Estate of Folly”? 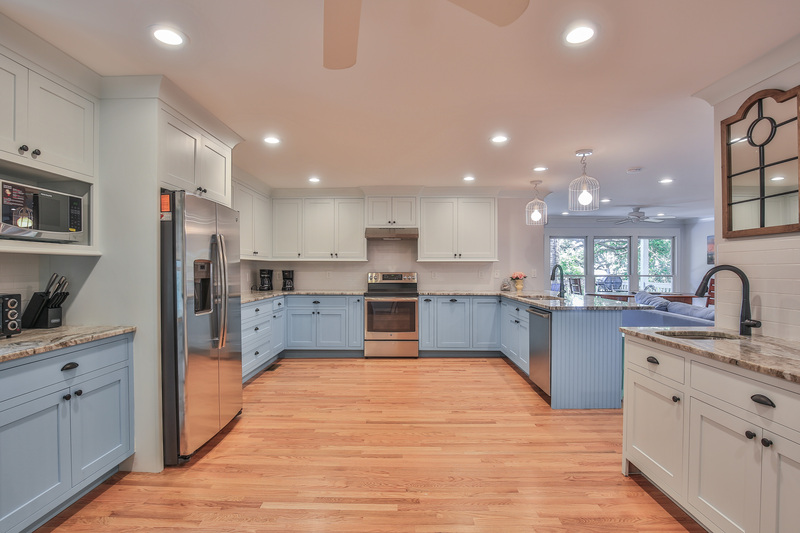 The blue lower cabinets, sleek appliances, and upper white cabinets balance the room. 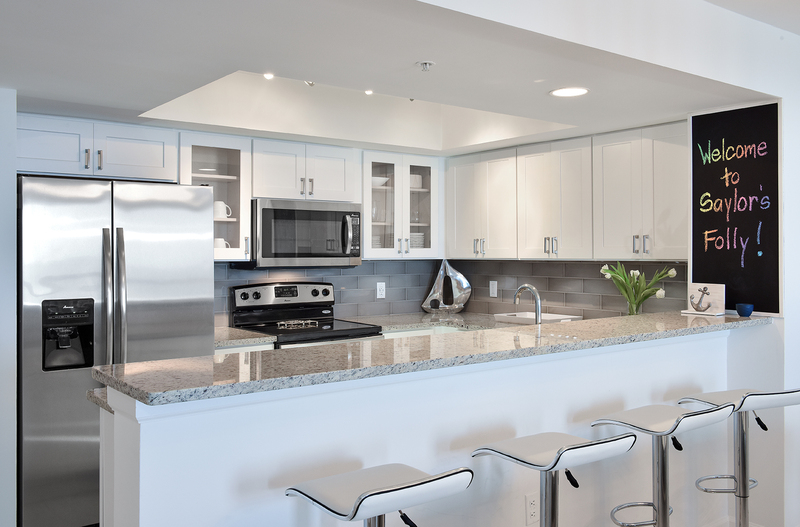 Guests love seeing the large fridge in D431 Shipwatch Villas “Xanadune”. A large fridge is ideal for families traveling together. Looking for things to do on the Charleston Coast this April? We’ve gathered some of our favorite local events and activities. Check them out and let us know which one is your favorite! Visit the Center for Birds of Prey for a Migratory Bird Walk with experienced birding guides. Recreational birdwatching is becoming a favorite past time across the country. Be sure to bring your binoculars and camera! April is the perfect time to enjoy the outdoors in the Lowcountry. 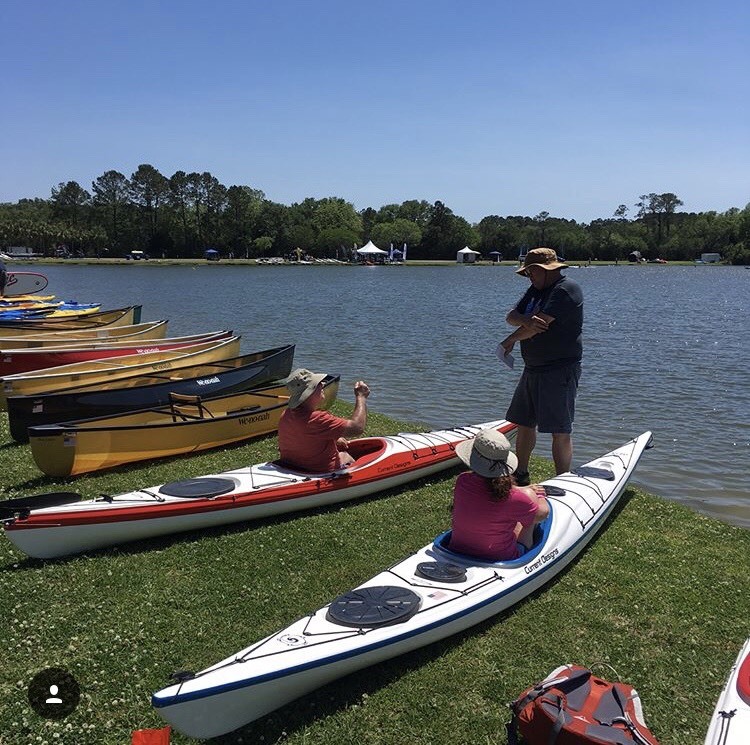 Head to the James Island County Park for a weekend of canoeing, stand-up paddleboarding, rock climbing, and more! Enjoy live music and vendors all weekend. And even try your hand at archery or mountain biking with the Try It Pass! 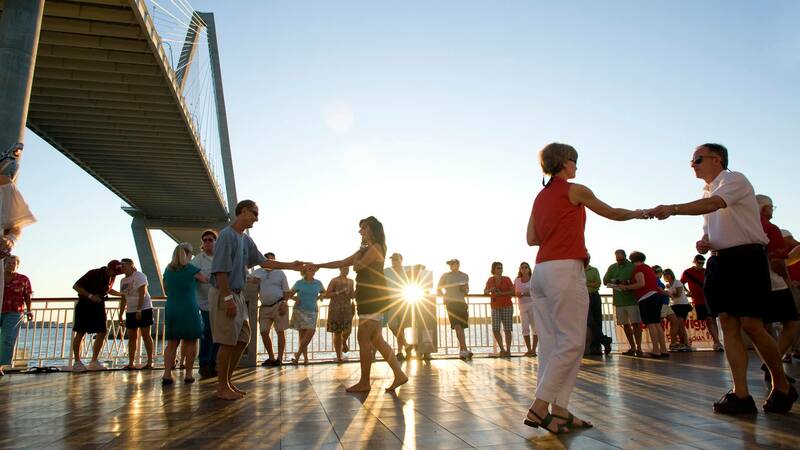 Put on your dancing shoes and head over the Mt Pleasant Waterfront Park for an evening of shag dancing and live music. The Carolina Shag is a descendant of the Jitterbug and originated in Carolina Beach, North Carolina. You don’t want to miss this fun-filled evening! 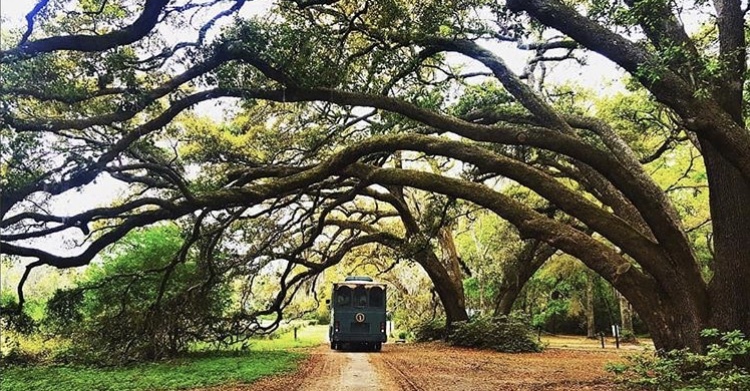 The Charleston Coast is full of things to do year-round but things really amp up in Spring. 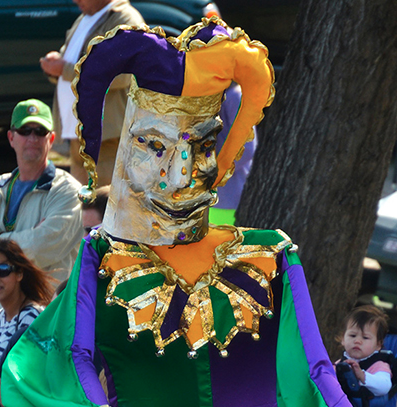 What are some of your favorite Lowcountry events and things to do? Let us know in the comments! Isle of Palms is a family-friendly beach destination offering everything you need while on vacation. Restaurants, fishing, watersports, and relaxation are abundant on the Isle of Palms. The Isle of Palms is connected to Mt. Pleasant, SC via the Isle of Palms connector. The connector (as it’s known locally) crests over the Intracoastal Waterway as you arrive on the island. Head straight through the one and only traffic light to go to the Isle of Palms County Park. Parking prices vary depending on the time of year. Most noteworthy, once inside the park, you have access to bathrooms, changing areas, and a playground! The County Park beach has lifeguards during the busy season. The Front Beach area of is located on Ocean Blvd. Classic beach restaurants and shops abound here. For oceanfront dining, visit Coconut Joe’s or the Coda del Pesce. Enjoy pizza at Luke n’ Ollie’s and at breakfast time, swing by Sea Biscuit Cafe for traditional southern fare. When heading to the beach, take one of the many beach accesses along Ocean Blvd. or Palm Blvd. The Isle of Palms beach is expansive and just went under a renourishment project. At low tide, and often even at high tide, the beach is perfect for bike rides and long walks. Take your time wandering the beach to look at the different shells, driftwood, and sea stars that call this slice of paradise home. If you enjoy water sports, head to the Isle of Palms Marina. At the marina, you can rent jet skis, go parasailing, and rent paddle boards or kayaks. 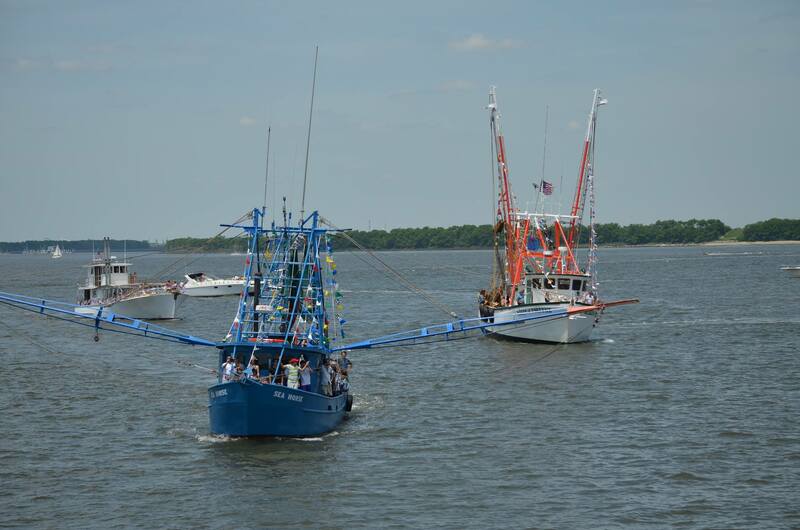 You can head out on a fishing charter for the day or rent a boat to enjoy the Intracoastal Waterway. And if you forgot your snacks, water, and sunscreen, stop by the Marina Store for local character and everything you need! At the end of your day at the Marina, pop up to Morgan Creek Grill for dinner and the sunset! Whether you are visiting the Isle of Palms for a day, a week, or a lifetime, we invite you to relax, unwind, and stay a while. Feature Friday highlights one spectacular property each week! This week we feature 88 Water’s Edge, My Blue Heaven. 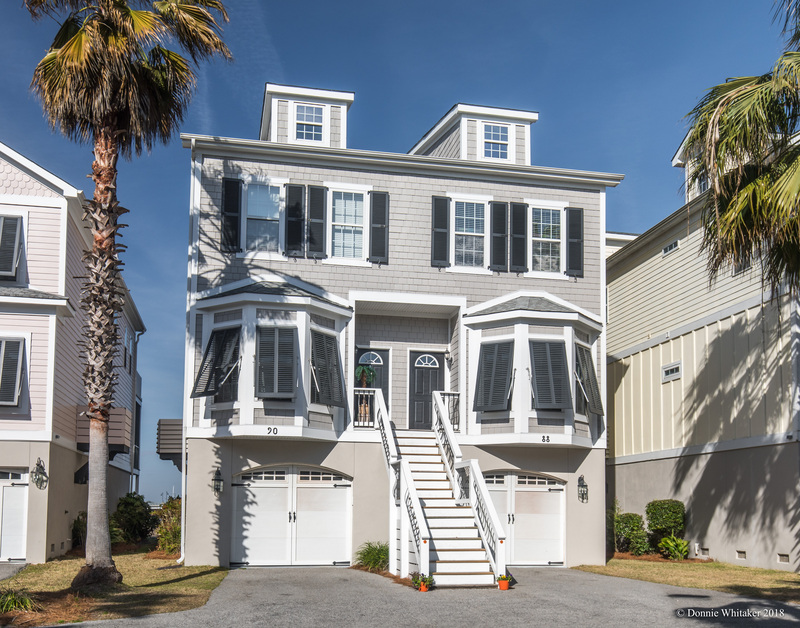 88 Water’s Edge is located in the Water’s Edge community of Folly Beach and is tucked just one block off Center St. Water’s Edge provides the best of all worlds: a quiet community just a short walk to the hustle & bustle of Folly life and just 7 blocks from the beach. The walk to the beach is about seven minutes, not too long, not too short. Positioned at the front of the community, 88 Water’s Edge provides plenty of parking to guests with two spaces available in the garage in addition to guest parking just across the lot. 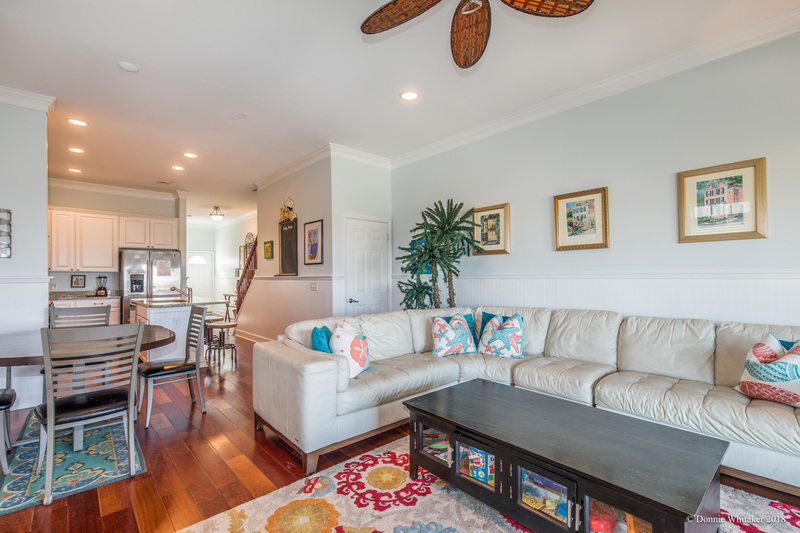 As you walk up the gorgeous front staircase and open the front door, you are welcomed home with the muted interior colors and understated beach decor. 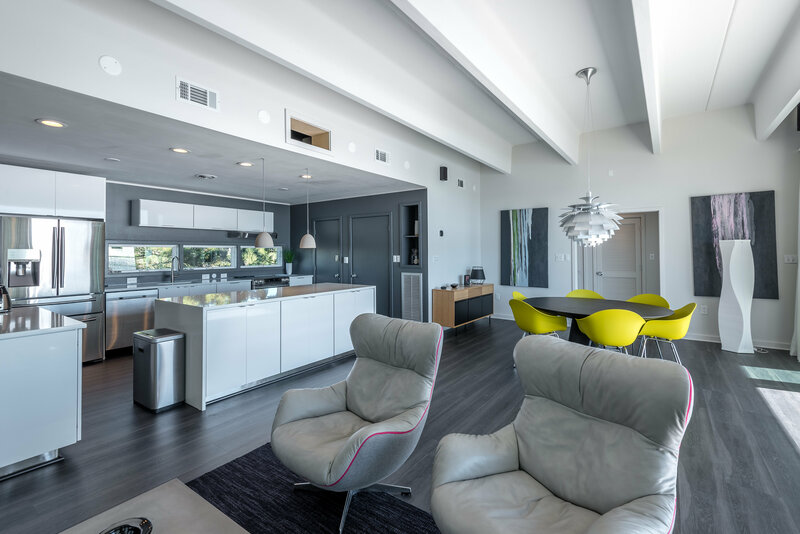 Continuing into the house, the foyer opens up to the open kitchen, dining, and living areas. The kitchen is completely renovated to include granite countertops, top of the line appliances, and a cute chalkboard sign – every kid’s favorite! Enjoy breakfast at the island bar or the dining room table. The living room features a large, comfortable leather sectional. Perfect for relaxing after a day at the beach, this sectional offers the perfect napping spot or the perfect place for the whole family to gather! A large screened porch overlooking the Folly River sits off the living room. The comfortable seating on the screened porch is perfect for watching the boats go by with an evening cocktail. 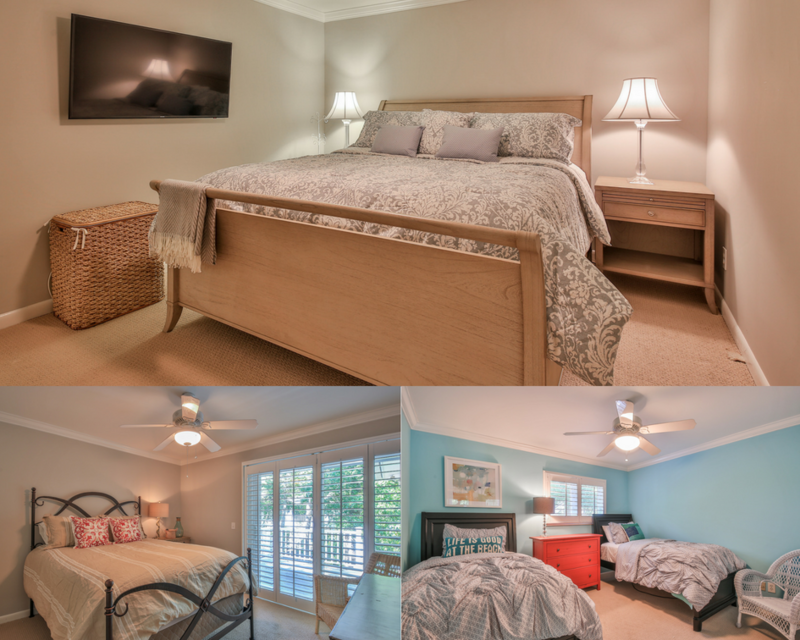 88 Water’s Edge boasts three bedrooms and each bedroom has its own bathroom. The bathrooms are gorgeous! All of the bathrooms underwent renovations in the winter of 2017-2018. The understated beauty of the bathrooms will have you and your guests talking about them your entire vacation. Now, the first bedroom is located on the first floor, to the right as you walk in the front door. This bedroom holds a queen bed and a large bay window for plenty of natural light. The second two bedrooms are upstairs, along with the washer and dryer closet. The first bedroom is perfect for kids, or those who are kids at heart! This bedroom offers two bunk beds, each with a double on the bottom and twin on the top. The private, renovated bathroom provides a tub/shower combo. 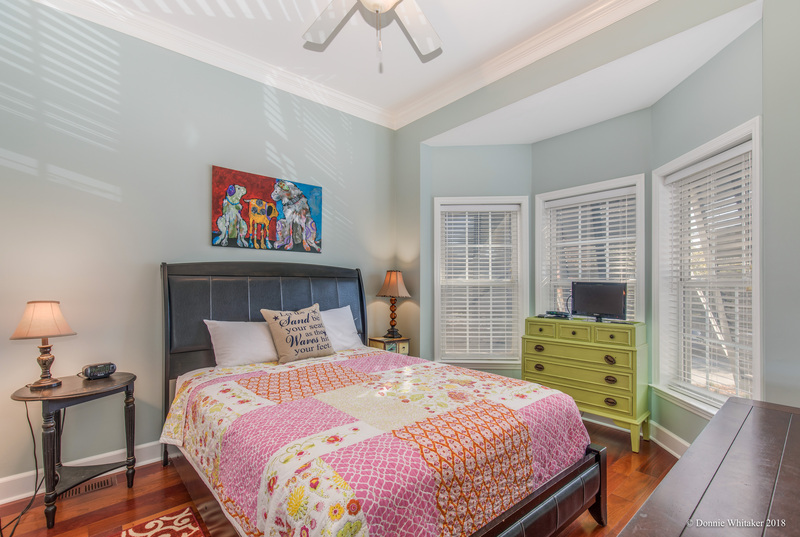 The master bedroom overlooks the Folly River with a private balcony. The private balcony is the ideal spot for early morning relaxation, with or without coffee! The master bedroom holds a king bed. 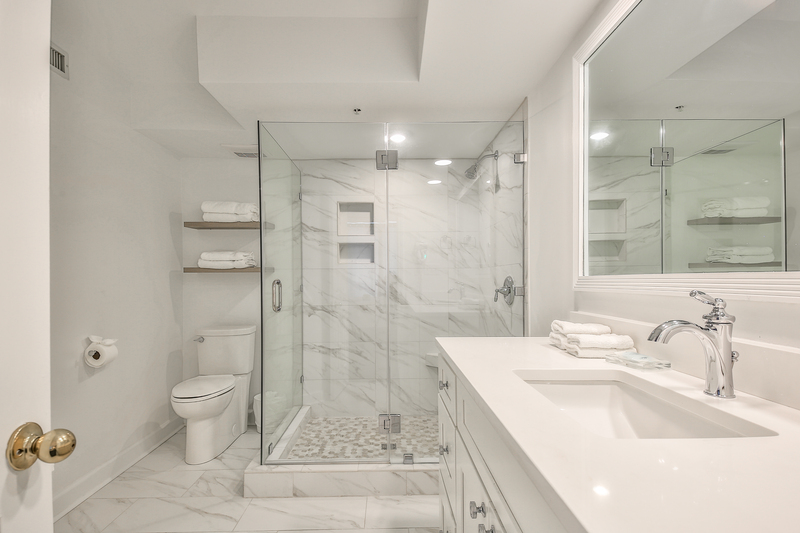 The master bathroom is the showcase of the home: featuring a beautiful walk-in glass shower and separate claw foot tub. If you decide you’re not quite ready for the beach, head over the community pool. The pool is a short walk from the home and overlooks the Folly River. Just off the pool area is the community dock, perfect for watching dolphins, paddle boarders, and sailboats alike. 88 Water’s Edge offers a luxury vacation at a fraction of the price. 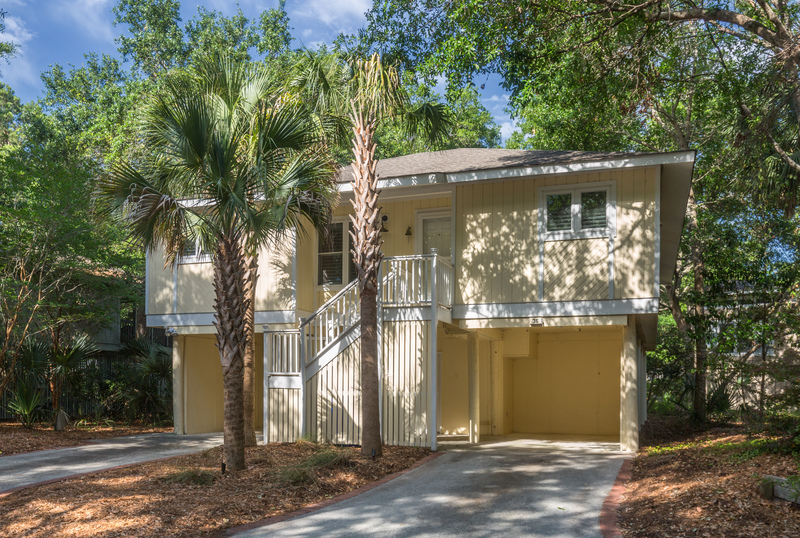 Guests who stay in Water’s Edge come back year after year to enjoy the quiet community that has it all. Book your stay today with one of our guest service representatives. We are local and here to answer all your questions about Water’s Edge, Folly Beach, and the Charleston Coast! February 7th is national Book Direct day. What does this mean? 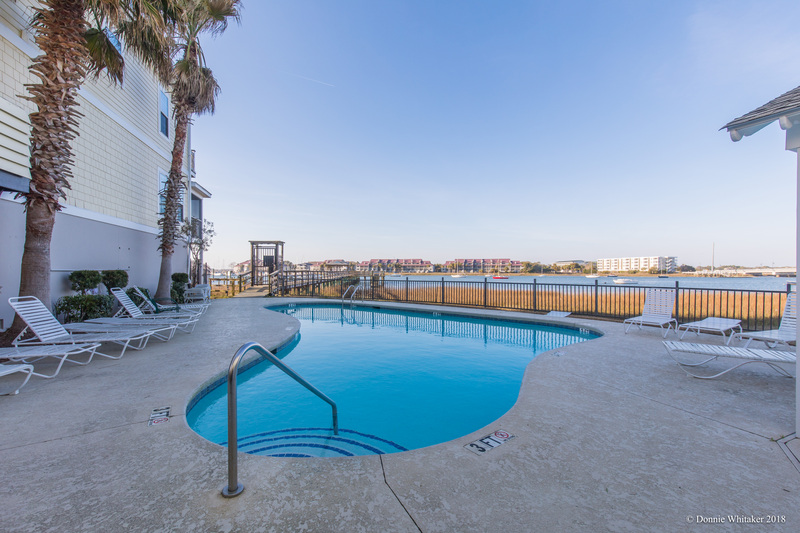 Well, when you book directly through a property management company, like Charleston Coast Vacations, you get the best price and the best service available. Third party sites, like Airbnb and VRBO, upcharge your reservation 10%-20%! This equates to hundreds, sometimes even thousands, of dollars extra on your vacation. Save that money so you have more to spend during your Charleston Coast vacation! Booking through local companies means you get an insider’s knowledge of the area you are visiting, along with the property you are renting. Local property managers visit the properties they manage regularly, often once a week, and can tell you everything you want to know about the property! Does the house have a crockpot? Is there a grill? How many pillows are in the house? At Charleston Coast Vacations, our local property managers are here to help you have the best vacation ever. But there is more to booking a vacation rental than the property. You must consider the area you will be staying in and what there is to do. 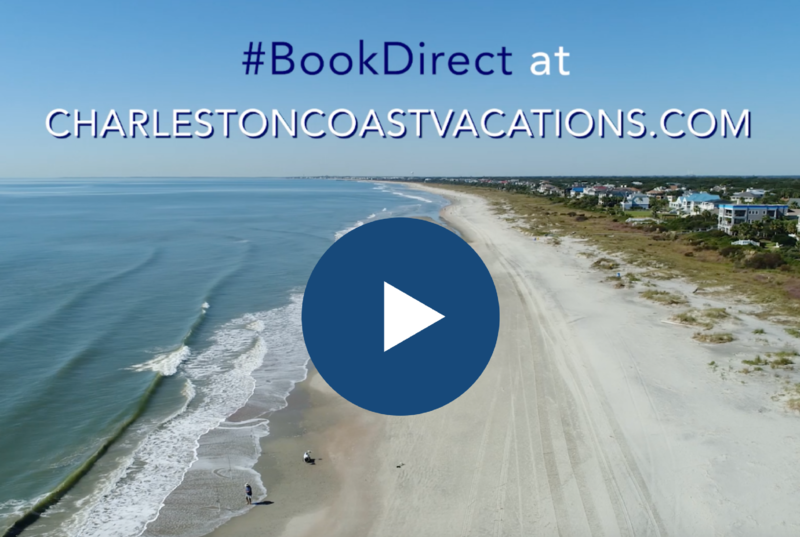 If you’ve never visited the Charleston Coast before or if you’re a regular to our lovely seaside towns, booking directly through a local company ensures you get the best recommendations on things to do. At Charleston Coast Vacations, our guest services representatives are here to help you plan your vacation. We have restaurant recommendations, we know the best tours in town, and can tell you all the best spots for surfing on the Charleston Coast. The properties we manage are listed on some of these third-party sites. This is so our homeowners receive national, and sometimes international, exposure. But, we are a local, family-run company serving the Charleston Coast for over 28 years. Our goal is for our guests to enjoy the Charleston Coast while creating beach memories to last a lifetime. So sit back, relax, and book direct today.